Do Ridge Augmentations Only Help Implants? A ridge augmentation is often performed following the extraction of a tooth. It is done to replace any missing soft tissue or bone that was extracted along with the tooth in order to create the natural contour of your jawbone and gums. Oftentimes, a ridge augmentation is done in order to successfully place dental implants. However, they have other uses as well. 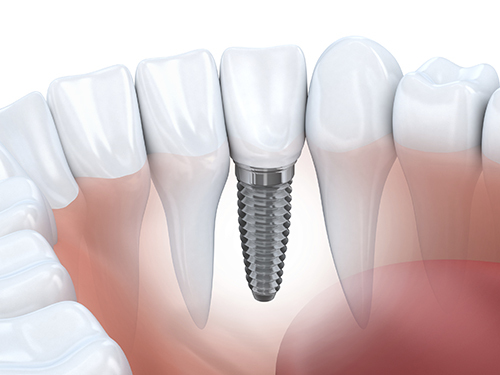 Dental implants are small titanium rods that are placed directly into the jawbone to act as roots for false teeth. These rods fuse with the bone help to stop the bone loss that is associated with tooth loss. In order to be successful, there has to be sufficient bone mass. A ridge augmentation restores any missing bone mass, allowing the implant to have the stability it needs for long-term function. A ridge augmentation can be performed for other restorative methods as well, such as dental bridges. Without an augmentation, dark spots can appear around your teeth, particularly in the area where the tooth was extracted, creating an unnatural appearance under your bridge. An augmentation, however, restores the natural contour of your jawbone and your gums, helping your bridge to appear more natural and therefore less noticeable. The spaces created when soft tissues and bone are removed along with the extracted tooth can lead to oral health issues. These spaces trap food particles, and can be difficult to remove. As a result, the stuck food particles attract bacteria, who migrate to the crevices and make themselves at home. Eventually, this can lead to gum disease and other infections. A ridge augmentation gets rid of these wide gaps, giving you an even, natural appearance where your tooth was extracted, and allowing you to keep your teeth and gums as healthy as possible. While a ridge augmentation can help to provide implants with a strong, stable base, this is not their only use. Contact our office today to learn just what a ridge augmentation can do for you and your oral health.